As history goes, the Silver Tips Resort stands on the grounds of the first full-fledged cinema hall in Munnar, built during the British era in the early 1900s. When you walk in, you are transported to a simulated movie-themed atmosphere; the regal lobby celebrates the historic Hindi movie, Mughal-e-Azam, the decor and props in the coffee shop celebrate, 'Sound of Music'. When you walk in to the restaurant, 'Maya Bazaar', the decor and interiors of the famed NTR mythological movie of the 60's beckons you. Take in the sights, as you traverse through the Hotel, checking out our movie props, replicas and equipment, the informative movie placards, and of course, when you retire for the day, the 'We Salute' rooms and suites dedicated to famous movies handpicked from all over India and the world, leaves you feeling like a Star, more like your brush with the glitterati from the tinsel world! 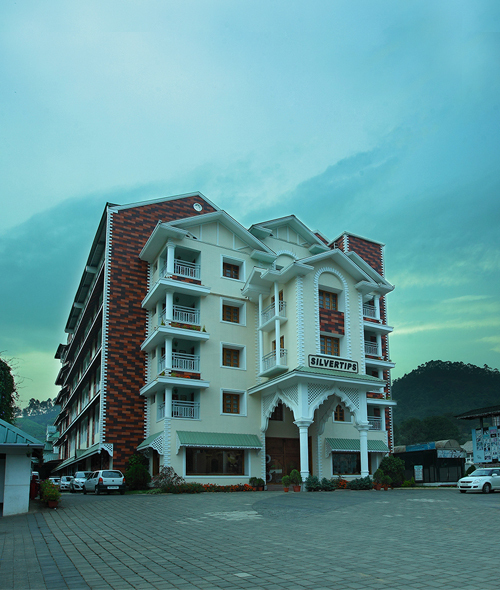 As the 'camera' retraces our steps, our unique Hotel history is definitely 'script' material.The Silver Tips resort now actually stands on what was once the iconic Pankajam Theatre which was an old well-known landmark theatre in Munnar back in the days. The theatre was built in the early 20th century in 1920 by Mr. A.S. Azhagannan Chettiar, a prosperous Indian businessman who was married to a British woman. Initially, only Silent Movies were shown and it graduated to featuring Talkies in 1927. This theatre definitely has a place in history as it was the only source of entertainment to people in those times. The theatre's structure resembled a small warehouse and as was prevalent in those days, with its distinctive 'bench' seating system, charging just an 'anna' and a shade of the present-day 'balcony' system which consisted of wooden chairs placed on a raised platform, laid out in 3 rows, and the ticket rates were a pricey '4 annas'! The theatre had its fair share of popularity and it offered non-stop entertainment to the locals showcasing Tamil movies and also English comedies which were featured once a week. As the 'camera' rolled with the time, moving on, the old theatre was transformed, razed down, and in its place a modern version of the theatre was erected in 1960. And then keeping up with the times, state-of-the-art projectors were imported from the United States. The first movie to be shown after the theatre was revamped was the Tamil movie, Bagapirivinai, starring Shivaji Ganesan and Saroja Devi. Pankajam Theatre stood the test of time, provided non-stop entertainment and leisurely distraction and after its founder-owner, Mr. Chettiar passed away, the property was acquired by us, E.V. Mathai and Sons in 1984. And as the saga continued, we further renovated the Theatre and we continued featuring the latest regional language movies. And as we were reaching 'The End', we had to do something about the property, it wasn't really viable to run the theatre anymore and it also was a very old structure. We dabbled with a lot of ideas, thought through and we finally hit upon the unique concept to celebrate the original building, its dedication and service to entertain the masses with 'Cinema'. The Silver Tips, Munnar bears evidence to that and we built a Movie-themed Resort, a perfect remake of the 'Original'!